No Major League ballparks are exactly alike, but certain aspects of the field of play must be uniform across baseball. The infield must be a square that is 90 feet on each side, and the outfield is the area between the two foul lines formed by extending two sides of said square (though the dirt portion of the field that runs well past the 90-foot basepaths in all Major League parks is also commonly referred to as the infield). The field must be constructed so that the bases are the same level as home plate. 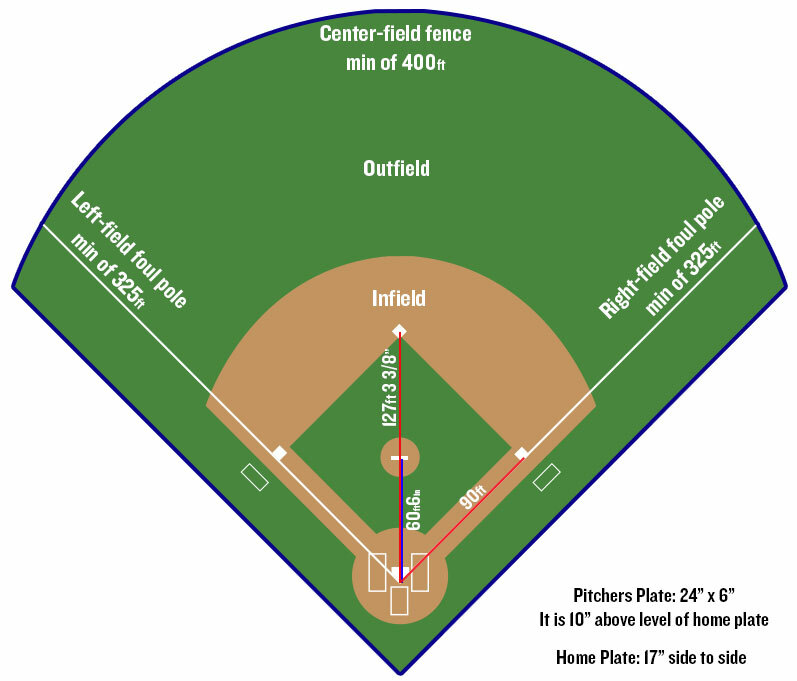 The rulebook states that parks constructed by professional teams after June 1, 1958, must have a minimum distance of 325 feet between home plate and the nearest fence, stand or other obstruction on the right- and left-field foul lines, and 400 feet between home plate and the nearest fence, stand or other obstruction in center field. However, some clubs have been permitted to construct parks after that date with dimensions shorter than those specified. The pitcher's plate must be a 24-inch by 6-inch slab of whitened rubber that is 10 inches above the level of home plate and 60 feet, 6 inches away from the back point of home plate. It is placed 18 inches behind the center of the mound -- which is erected within an 18-foot diameter circle -- and surrounded by a level area that is 5 feet by 34 inches. The slope of the pitcher's mound begins 6 inches in front of the pitcher's plate and must gradually decrease by 1 inch every foot for 6 feet in the direction of home plate. Home plate is a 17-inch square of whitened rubber with two of the corners removed so that one edge is 17 inches long, two adjacent sides are 8 1/2 inches each and the remaining two sides are 12 inches each and set at an angle to make a point. The 17-inch side faces the pitcher's plate, and the two 12-inch edges coincide with the first- and third-base lines. The back tip of home plate must be 127 feet, 3 and 3/8 inches away from second base. The other bases must be 15-inch squares that are between 3 and 5 inches thick, covered by white canvas or rubber and filled with soft material. From the early 1900s through 1968, the pitcher's plate was permitted to be 15 inches above the level of home plate. That height was lowered to 10 inches starting with the 1969 season, in response to a 1968 campaign -- now known as the "Year of the Pitcher" -- in which the dominance of hurlers reached new heights. The specification on minimum park dimensions was put into place due to the stadium controversy surrounding the Brooklyn Dodgers' move to Los Angeles in 1958. The Dodgers played at the Los Angeles Memorial Coliseum while Dodger Stadium was being built, but the Coliseum was not designed to hold baseball games. The Coliseum's left-field fence was roughly 250 feet away from home plate and the club had to erect a 40-foot-high screen to protect against short home runs. The specification is not strictly enforced, however, so long as teams do not build parks that egregiously violate the rule. For example, Petco Park opened in 2004 and is officially 396 feet in center field, and Oriole Park at Camden Yards opened in 1992 and is 318 feet down the right-field line.